Catrina McQueen of Martin Luther King Jr. HS & Morgan Elise Roberts of Hightower ES were 2 of 3 essay contest winners. The Atlanta Dream announced the three winners of their “I Have a Dream” essay contest- two being from DeKalb County School District. Over 400 students from 46 schools submitted 300-500 word essays for the 2017 “I Have a Dream” essay contest, expressing their dream and describing the impact of Dr. King’s historical speech. 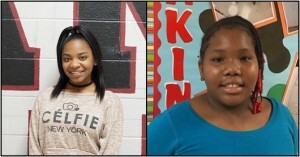 Catrina McQueen, a senior at Martin Luther King Jr. High School, and Morgan Elise Roberts, a 5th grader at Hightower Elementary School, were two of three students whose essays were selected by a panel of judges including, Atlanta Dream president Theresa Wenzel. Each student will receive a visit to their school from the franchise, and will also be recognized prior to the Atlanta Dream’s 2017 home game opener on May 21. Catrina, being a graduating senior, will be eligible to receive a $500 scholarship from the Atlanta Dream Youth Foundation.